Tom & Gisele to Tie the Knot? Rumors on the web say Tom Brady proposed to longtime girlfriend Gisele Bündchen -- but is it true? According to TMZ, the Patriots quarterback popped the question aboard a private jet from New Jersey to Boston on the day before Christmas. The jet, which was carrying Bündchen's parents as well, was reportedly filled with champagne and four dozen white roses. 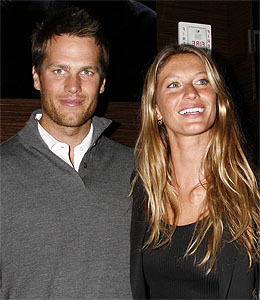 This would be the first marriage for both Gisele and Tom. Brady has a son, John Edward Thomas Moynahan, with actress ex-girlfriend Bridget Moynahan. UPDATE: Brady's father, Tom Brady Sr., told The Boston Globe there is no need to celebrate, "Nobody told me. We talked to him and there's nothing to say. It's rumor, rumor, rumor." In an email to The Boston Herald, Bündchen's twin sister Patricia said the rumors were "not true."